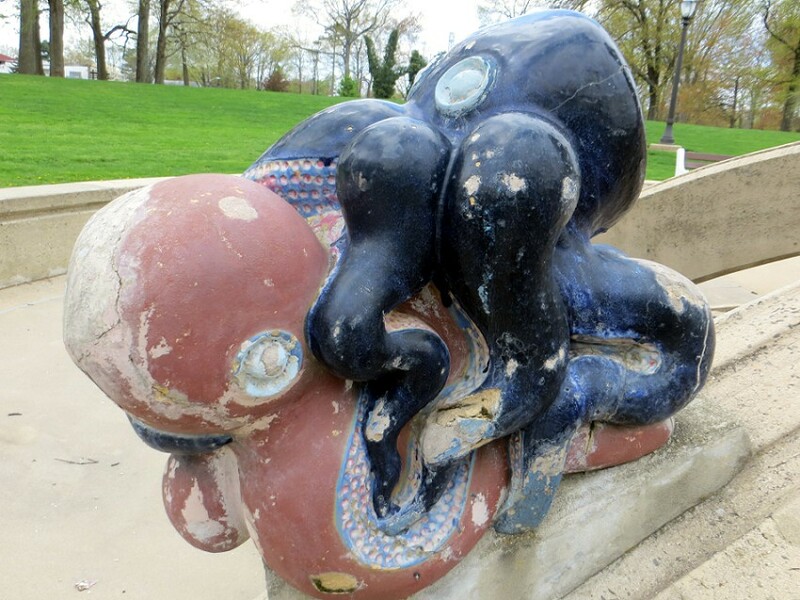 May 4, 2014 — I don’t know if good will win in the end or if it’s more like Dark Helmet predicted, “Evil will always triumph because good is dumb.” But I do know sculptor Waylande Gregory’s take on it, because I’ve seen his fountain, where he explains his position with copulating octopi, multi-headed stockbrokers, and skinny naked chicks. We pulled into Roosevelt Park in Edison, New Jersey, a park named for a president in a city named for an inventor in a stated named for a piece of sports apparel, and parked in the small lot on Pine Drive. Across the road we could see the large war veterans memorial. That memorial is august and civic, all bronze reliefs and stone slabs and flags and landscaping. Bland as the word itself. We passed it without so much as a blurry pic on our phones. But what the memorial hid behind it was a revelation…in the Biblical sense. 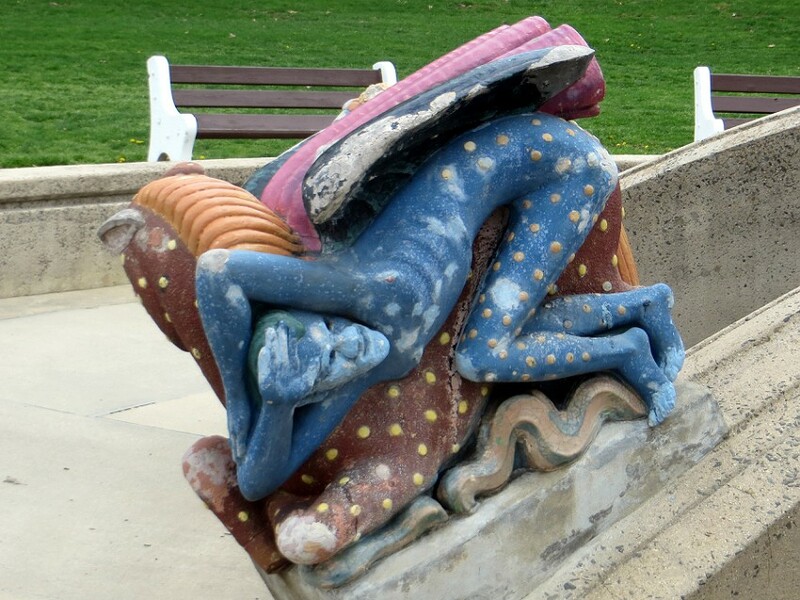 Waylande Gregory was Kansas-born New Jersey transplant and an innovator of ceramic sculpture. He figured out a technique for making large forms in the medium. His Light Dispelling Darkness, which he created in 1938, is an example of the results of that technique. 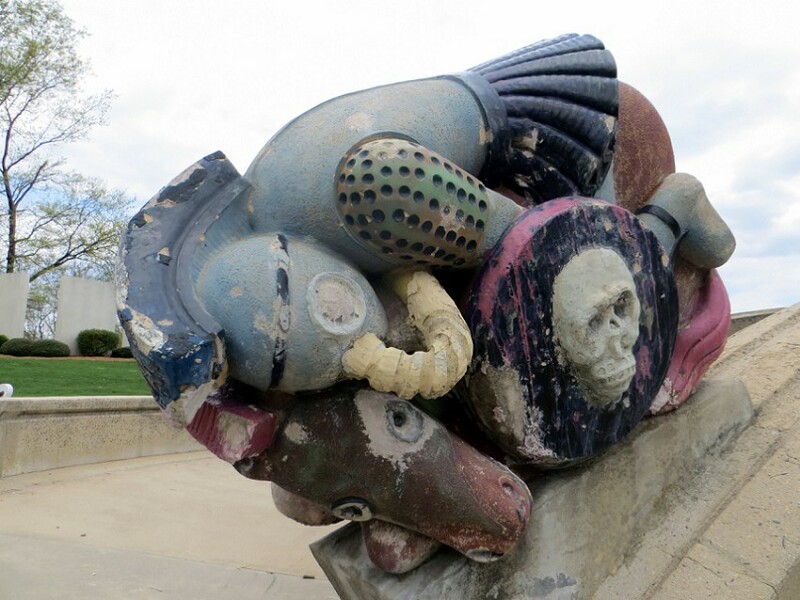 It’s comprised of terra cotta and concrete, and it’s easy to see which is which as the terra cotta is glazed in three rainbows’ worth of colors like the fountain was meant for a children’s playground…except for the fact that it depicts horsebacked skeletons and polka-dotted personifications of disease. I feel like when Gregory laid the blueprint for the fountain on the table to show the governing board to get its approval, he surreptitiously leaned his arm on it to cover the bottom of the fountain so that they’d just see the top. 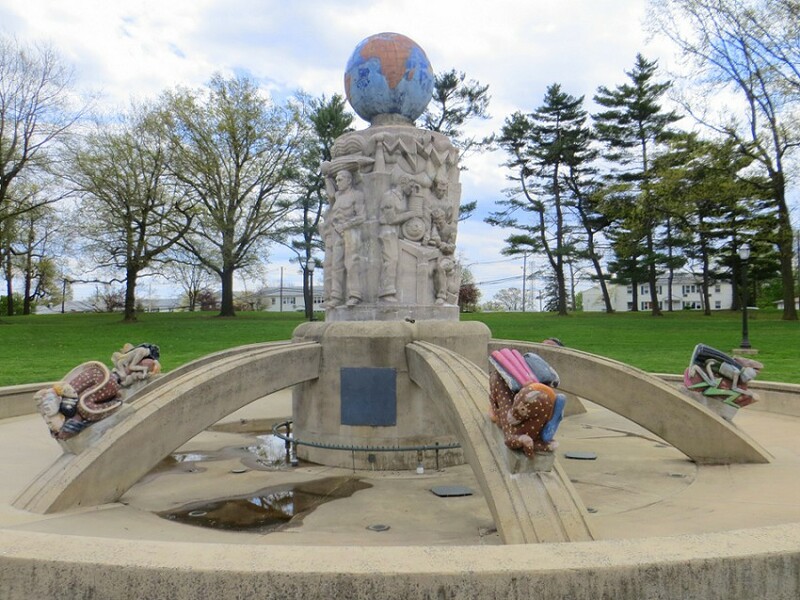 Up there is a conceptually straightforward 9,000-pound terra cotta globe of the planet perched atop a tall concreted pedestal carved with images of people doing good things…cutting-edge science and sweaty, bare-chested labor and wise and measured peace discussions. The “light” in the fountain’s name. 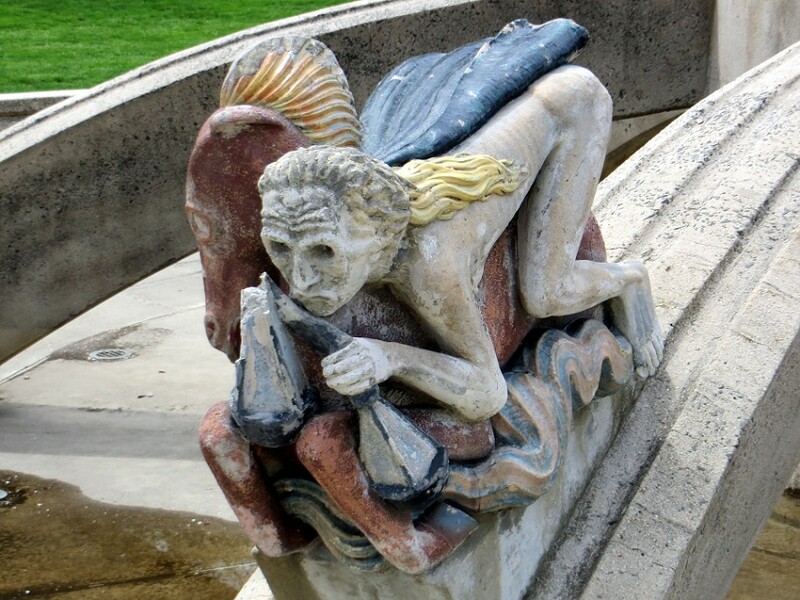 But at the base of the fountain, at the end of buttresses arcing out of the 40-foot-diamter pool like they are being kicked out of the sculpture (the “dispelling” part of the name) are the Six Horsemen of the Apocalypse, all in crayon-box Technicolor….the “dark” part of the name. Stop it. I know there are only Four Horsemen of the Apocalypse. I’m all caught up on Sleepy Hollow Season 1. But Gregory wasn’t satisfied with a quartet of devastation. 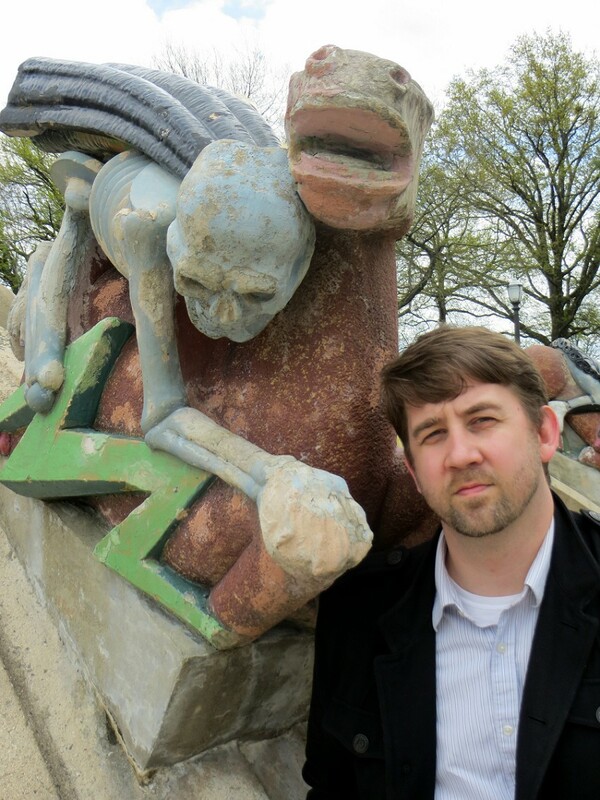 He wanted a herd of apocalyptic horseman. So in addition to the first string players of War, Death, Pestilence, and Famine, he created terra cotta statues of Greed and Materialism. He didn’t put them on horses, though. Greed is represented by wrestling purple and pink octopi. Materialism, by a five headed day trader beast with a stock ticker tape dorsal fin. 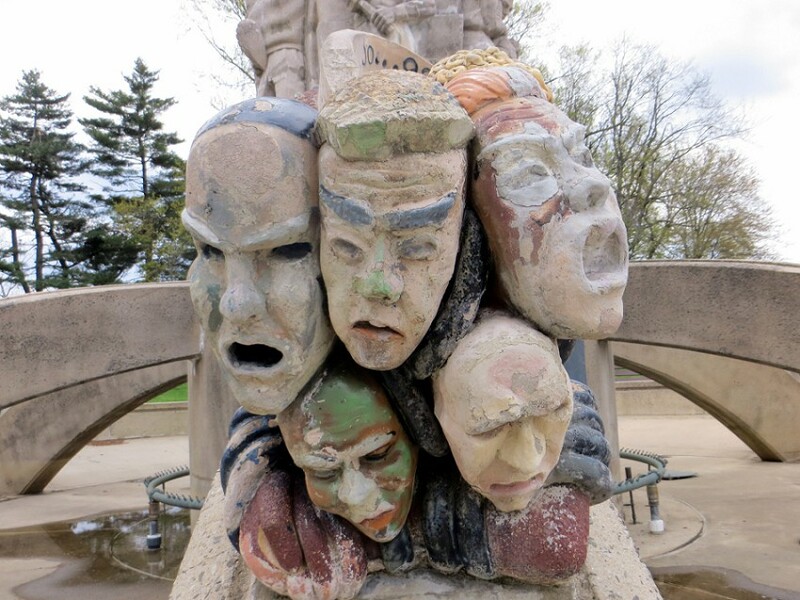 While these six sculptures might technically be getting bottom billing, they’re definitely the stars of the show, with their myriad colors and eye-level placement and large size…but mostly it’s because they’re horrifying enough to entrance. From Famine’s sunken eyes and bony buttocks to War’s skull shield and gas-mask helm, they’re not the most pleasant guardians for your picnic in the park. 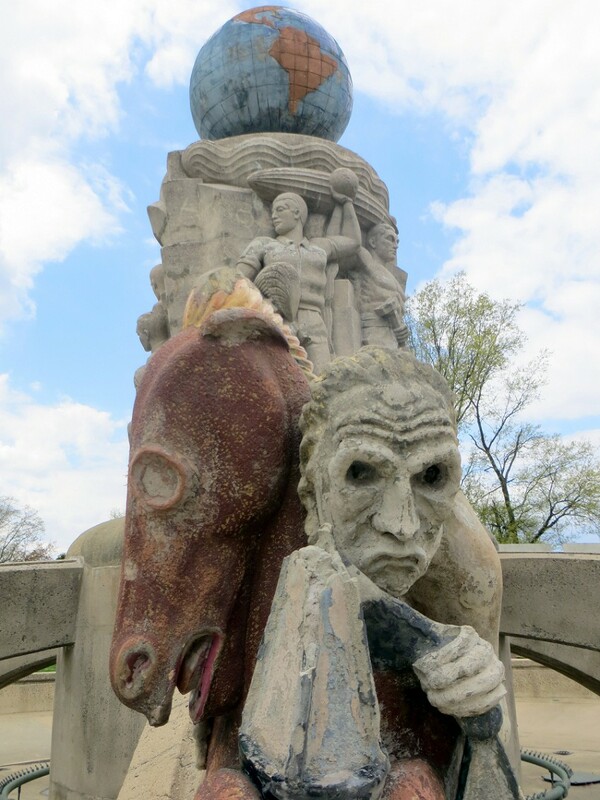 The fountain has seen some deterioration over the years that adds to the horror, but not as much wear as you might think. That’s because it underwent a big restoration in 2005. If you’re entrusted with something as bizarre as this, you owe it to humanity to care of it. On our visit, the fountain wasn’t fountaining, although the plumbing was leaking small pools of water at the base. That gave me the opportunity to jump in and see the figures up close in all their playful ghastliness. You can find pics online of the fountain when it’s turned on, and, while it’s not that impressive a show, it continues the theme of light dispelling darkness, with all its Thomas-Edison-and-his-bulb-of-light undercurrents that the name of the fountain and its location near the Menlo Park headquarters of the famed inventor implies. So I don’t know if these things are more terrifying wet or dry. But I do know I’ve never written a statement like that before.